Toast anise, 2 tablespoons peppercorns, and cloves in small skillet over medium-high heat until aromatic, stirring often, about 2 minutes. Wrap spices in triple layer of cheesecloth; tie shut. Pound with rolling pin to crush spices lightly. Bring 3 cups water and sugar to boil in medium saucepan. Add spices in cheesecloth. Remove from heat; cover and steep 15 minutes. Add 1/2 cup thyme sprigs; cover and steep 10 minutes longer. Strain syrup into medium bowl. Chill until cold. Do ahead: Can be made 1 week ahead. Cover and keep refrigerated. Fill 8 tall glasses with ice. Divide syrup among glasses. Add 1/2 cup soda to each glass. 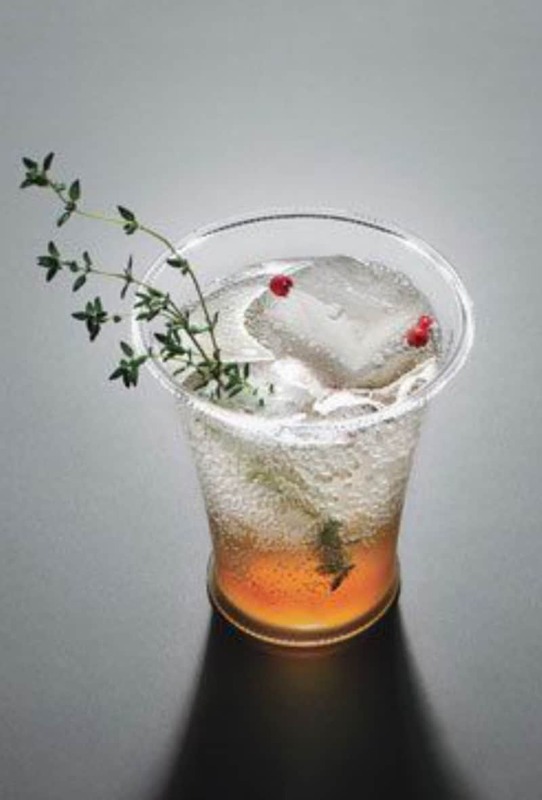 Garnish with thyme sprigs and peppercorns.